Our technology is applied at the unaware portion of the car you board. We supply many types of under-floor swichboard box for Shinkansen and commuter trains, which contain switchboards, relay boards, and other equipment indispensable for train operation. We design and manufacture large and small switchboards. Switchboard contains many circuit breakers which have combined structure of switch and fuse, and it secures the safety of various electrical equipment. This control board transmits to each vehicle the information on train running and stopping which are sent from driver's platform and ATC system. 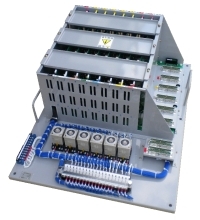 The board uses high-reliable sealed-type relays and printed circuit boards to ensure high reliability. We supplied many types of heater based on our long history and accumulated experience. The heaters are installed beneath the seats of car.